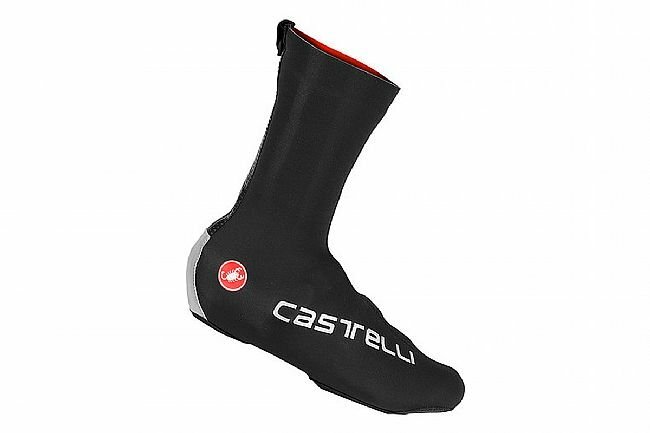 Designed at request of Team Sky, the Castelli Diluvio Pro Shoecover is intended for keeping your feet warmer in cold and wet conditions. Featuring 33% neoprene and a taller cuff height to add more coverage in the lower leg. The top edge is raw cut for a flush fit next to the skin to seal out the elements, keeping water out while remaining very stretchy and easy to put on. Reflectivity on the heel provides improved visibility in low light conditions. 4mm neoprene fabric will stand up to the wettest and coldest winter riding conditions. Seams are glued and stitched for added protection from the rain. Water-resistant YKK zipper at back. Pro fit with added height. Reflective heel and side print for safety. Four and a half stars anyway. These are definitely warmer than others I've tried, also fairly easy to put on and take off. My feet still get cold on longer rides but these make it so it's not painful to walk when you finally get out of the saddle, it also doesn't take very long to warm back up once you get back inside. Excellent to keep toes warm in the 34 degree temps. Tested out these shoecover during cold weather in Florida and it held up pretty well. Yes, it does get cold here in Florida, around 34.8 degrees. Not only cold but with the humidity, it always feels colder than Colorado. I have traveled between states and Colorado is more of a dry cold, but Florida's humidity makes it very uncomfortable when it's below temp. Anyway, rode for 84 miles and my feet didn't feel numb or tingling like how it usually does with my Pearl Izumi shoecover. But, at the end of the ride my ankles were a little wet from the sweat. Highly recommend these shoe covers during the cold months.